‘ How long have you been homeless? I don’t really know. It’s been awhile. The conversations taking place around the breakfast tables set up in the Kiewit Fitness Center had just this kind of tenor Friday as Creighton University played host for the 12th time to Project Homeless Connect Omaha. The event is intended to be a one-day, one-stop opportunity for the area’s homeless community to plug into resources for housing, food, legal and medical issues and other benefits. Aided by several hundred navigators tasked with guiding guests through the multiple services Project Homeless Connect Omaha makes available, the day was awash in insight and experience. I’m sleeping on a floor, but I’ve got a nice mattress. The stark realities of the world come drifting in the doors of the KFC every 20 minutes or so. Mostly, they are people who don’t look any different from anyone else in the world. I had a job. A good job. And 20-odd years later, here I am. 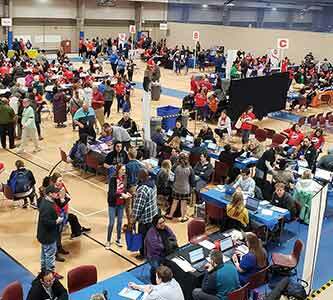 Alexandra Mihalakakos, a senior in the College of Nursing, has participated in three of these events in her Creighton career and said not one has gone by in which an interaction did not move her and change her thinking about homelessness and those it affects. I know I’m at high risk. But what do I do? The ongoing, unfolding trauma of living on the streets is disorienting. The societal response is often that homelessness is a problem of the victim’s own creation and from which they can emerge whenever they wish. I haven’t seen him in a few months. I hope he’s OK.
Last year, both Mihalakakos and Jacobsen worked providing immunizations to the Project Homeless Connect guests. The experience brought home for Mihalakakos the stress of life on the streets. Sitting down to breakfast with the guest she was serving, Jacobsen said she asked the man to tell her a little about himself. He just stared blankly. Nguyen said the stigma does not remove easily but falls too facilely into a dehumanizing attitude. As volunteer staff readied themselves for the day, Ed Shada, BS’79, the founder and CEO of Project Homeless Connect Omaha, took a moment to address them and give encouragement.